Even right now, in the midst of early-ish development, there is so much to explore, notice, and study. I noticed there are some of us here on the forums who like to infer or even make up things about a system or planet based on what we observe by its type, color, shape, etc. While we can easily write these things down in a document or blog, etc, I think it would make SE all-the-more interactive and personalized if it had a built in Journal, where we can write our own entries about particular locations. An entry could include fields to specify the location, the time perhaps, and a selection of screenshots to even insert in the body itself. Over SE's development, when more types of cosmic bodies and phenomena are implemented, we will have even more to record and talk about in this journal. 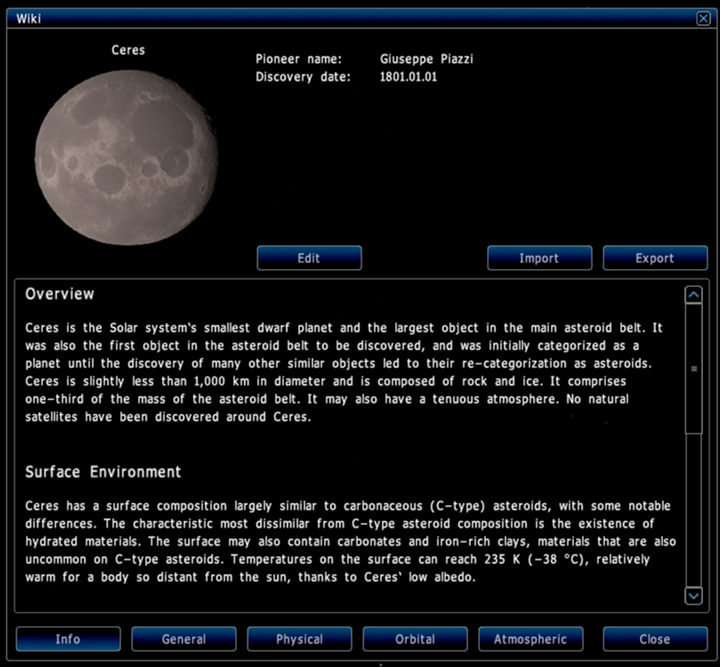 There will be a functional text-editor for making descriptions of planets. It wasn't in 0.9.7 because Spaceengineer was being pressured to release as soon as he could so he left it out. I wonder if he'll happen to implement it in 0.9.7.1. I don't imagine it to be any more complex than the table feature adjustments he's been making. I don't imagine it to be any more complex than the table feature adjustments he's been making. A well-featured in-game text editor is not even close to the same thing as a simple display table, so it makes little sense to compare them. I'll take your word for it. (I'm certainly no software programmer). And it's already in SE, just hit I or right-click on a planet and hit Info. Then hit edit and give it a name (if it's a procedural object). This will add an entry for it in the database file. You have to manually edit the database text file to get the info you want, but it's not that hard. Read more about it in this post here. I can link Wiki's description to the Journey Log (that can be called by Tab button). Like a button "View details" that will open Wiki for this object. Screenshots is another good idea, but I thought of just saving location, and then render a preview with the engine (like in the Wiki). Or just small image 512*384 or so, that will not consume many disk space (but in this case it must be transferred by network to the server). Such screenshots may be visible in the Journey Log and the Locations menus. Text editor might have an button "Snapshot", pressing it you will be able to locate camera and take "screenshot", that will appear inside the text. You may move screenshots with mouse in any location inside the text. Visited and described locations may be available from another menu, "Research log", and can be highlighted on the Universe Map. Journey Log's locations may be highlighted too, and joined with lines, like in the Spore game (this have little sense in Planetarium, but will have more sense in the game). And locations from the Locations menu of course. So, if I understand correctly, we'll eventually be able to add/edit a planet's description right inside of SE then, is what I'm gathering, but for now, we'll have to edit it by creating a file by renaming an object in SE's wiki and then going into the file itself via text-editor and putting one in there? I'm having trouble with editing the information on a planet this way. I've taken a planet, exported the info into a cfg file in the exports directory, opened it up in notepad++, and added descr "text" to it, as the info page you linked to demonstrated. I saved it, and then attempted to import this file into the planet description. It doesn't seem to be importing it though. There is still no description. I've tested it further by changing the pioneer name in the file, but it doesn't show this change either. I'm apparently doing something wrong in the process of importing the information. Edit: I got it. It was all about clicking the right check box in the import dialogue along with the name of the file. No no no, that's not what to do. You need to hit EDIT, then give the planet a name, then open the database file as described in the post I linked to you. In your case this would be eng-db.cfg. The new entry should be at the bottom, and should have the name you gave it. That is what you edit. I figured that was another way to do it. Would I have to restart SE to have it update? With the way I have done it, I can individualize the object in its own separate file (which is what I feel most familiar with), and won't have to search through a whole database file to find it. Though I'm sure there are certain other inefficiencies by doing it this way. 1) Select a planet which you want to describe. 2) Hit [i] key to open Wiki. 3) Press [Edit] button on the Wiki's window, enter the name for the planet, and press [Enter] or [Save]. This will add a new entry to the database file. Descr "This is a second planet I visited in this system. A huge and hot gas giant have no moons." 5) Save the file and restart SE. I think the reason I found myself doing it the other way is because with the way I was doing it, I can change this information and import it without restarting SE at all (and the information changes on the fly on import - its a good and working feature here), and upon hitting the save button after importing from the file, it automatically updated the entry in that db file by itself.